A photo of the 'heroic' ginger feline was published on the official Facebook page of Russia’s Ministry of Defense. 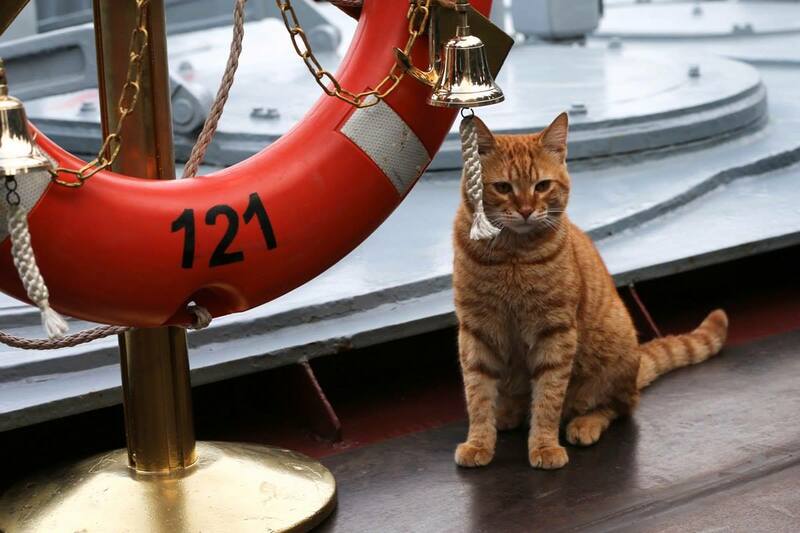 Russia’s Defense Ministry has published a photo of the first cat to earn its sea legs on a long range voyage with the Russian Fleet to the Syrian coast. Internet users have been discussing its probable name and even suggested giving the cat a military rank. The Western media has also picked up on the photo. The UK Telegraph newspaper wrote: “This cat has a more perilous job than the moggies the British have in Westminster, who chiefly meet foreign ambassadors and catch mice". Cats have been serving aboard ships for hundreds of years and have become full-fledged members of the crews, receiving awards and medals, and even monuments. Since time immemorial cats have been an essential part of any ship: they not only kill rats, but they also comfort humans. Where else do Russian cats serve? 1. Botsman ('boatswain') is serving on the nuclear-powered cruiser Kirov in the Russian Fleet. He carries out all the commander's orders irreproachably, undergoing enhanced training with the help of a laser pointer on a regular basis. He has several furry mariners under his supervision who have their own responsibilities: Some are on duty in the gangway, memorizing the faces of those walking by, while others serve by the large mess room, attentively studying those entering. As a reward for good service, Botsman is allowed to take a walk in the Zvezdochka shipyard at Severodvinsk, in the Arkhangelsk region, where there are mice and rats aplenty. 2. River cruise ships also invite cats on board. The Vodokhod company has two cats on their vessel. One is also called Botsman, and his assistant is named Matros (‘deckhand’). 3. Museums usually have storage facilities in their basements, where there are a lot of rats. Many well-known museum cats live in St. Petersburg’s Hermitage. Cats have resided in the famous museum since the time of Empress Elizaveta Petrovna. In 1747, she issued a decree arranging for a chauffeur to bring “house cats suitable for catching mice” to the Winter Palace. A carriage full of Russian Blues was ferried post-haste from Kazan to the imperial residence in St. Petersburg. Serpukhov's Museum of History and Art in the Moscow Region has also hired a cat. 4. Sport mascots. Mashka the cat is a living symbol of ice hockey club Dynamo Moscow. Many believe that this ginger feline brings good luck to the team. During one match the cat darted under the feet of Alexander Radulov, the star player of the away team CSKA. He tripped over, after which Dynamo gained the upper hand, causing CSKA to lose not only the game but the whole series. It was this story that made Mashka everyone’s favorite cat, and gained her an extra 1,500 followers on Instagram and Twitter.